JetPay is a robust HR and payroll solution. The platform also offers a slew of other services including time management, workers’ compensation, and benefits administration among others. JetPay delivers a standard payroll service that comes with payroll tax filing, direct deposit, Form W-2s, General Ledger interfaces and more. 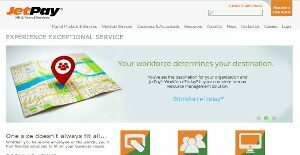 JetPay offers a separate module for human resources management called WorkForce Today. This module is designed to work with all business sizes and types, ranging from a small startup with less than 10 employees to giant corporations employing thousands of professionals. With Workforce Today, users enjoy essential human resources management tools and capabilities such as applicant tracking, onboarding, open enrollment, and customizable dashboard. With JetPay Payroll services, you are in total control on how you wish to submit your payroll information. Whether through online channels, PC, phone or fax. The Payroll service comes with a dedicated payroll specialist who will help you with all your payroll processes and provide you with top class assistance and support whenever you need help. JetPay Payroll also helps you with your tax filing requirements. This offering promises to take care of all your payroll taxes and file them accurately and on time. No need to worry about beating tax deadlines or spending countless hours preparing tax checks, making deposits, preparing and filing tax returns. JetPay ensures that you remain compliant with hiring policies and regulations. With JetPay New Hire Reporting, you can be sure that you adhere to the Personal Responsibility and Work Opportunity Act of 1996. The service will supply you with a new hire report or file electronically on your behalf so you don’t have to. JetPay’s human resource management module, Workforce Today, gives your businesses that significant edge by streamlining all tasks and processes pertaining to HR. Whether you are running a small company or a large corporation, Workforce Today equips you with the innovative tools that help you manage your greatest asset – your employees. From posting jobs to tracking applicants to storing resumes and onboarding new hires, Workforce Today handles all that and more. Aside from managing employees, you can also manage your assets, monitor their training and certifications, and administer employee benefits. There are trendy and widely used solutions in each software category. But are they essentially the best fit for your company’s unique wants? A market-leading software product may have thousands of users, but does it offer what you require? For this reason, do not blindly invest in popular systems. Read at least a few JetPay reviews and mull over the elements that you wish to have in the software such as the cost, main tools, available integrations etc. Then, shortlist a few apps that fit your requirements. Try out the free trials of these platforms, read online reviews, get clarifications from the seller, and do your investigation meticulously. This in-depth groundwork is certain to help you find the finest software application for your company’s unique wants. How Much Does JetPay Cost? JetPay’s pricing plans are available upon request. We realize that when you make a decision to buy Payroll Software it’s important not only to see how experts evaluate it in their reviews, but also to find out if the real people and companies that buy it are actually satisfied with the product. That’s why we’ve created our behavior-based Customer Satisfaction Algorithm™ that gathers customer reviews, comments and JetPay reviews across a wide range of social media sites. The data is then presented in an easy to digest form showing how many people had positive and negative experience with JetPay. With that information at hand you should be equipped to make an informed buying decision that you won’t regret. What are JetPay pricing details? What integrations are available for JetPay?